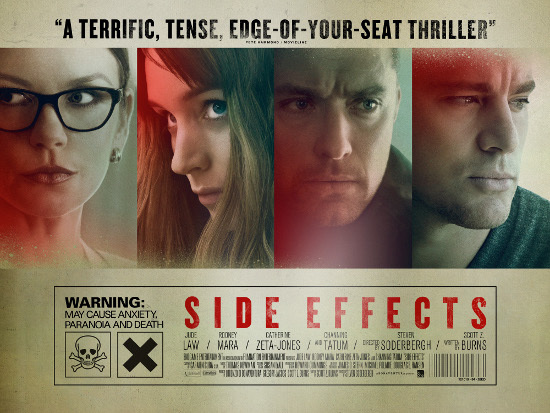 Steven Soderbergh's highly rated psychological thriller (and possibly last feature film) SIDE EFFECTS is in cinemas today! We haven't seen it yet but hope to remedy that this weekend. If Robbie Collin @robbiereviews gives it 5 stars, that is good enough for us! To celebrate the release of SIDE EFFECTS opening in cinemas nationwide today we have an incredible competition to give away a poster signed by the star of the film and regular Steven Soderbergh collaborator, only motherflippin JUDE LAW! 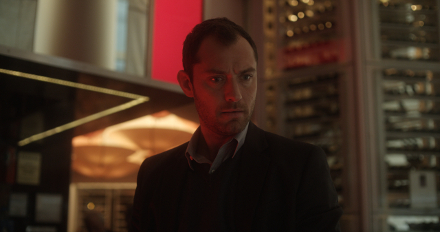 In SIDE EFFECTS Jude Law stars alongside Rooney Mara hot off The Girl with the Dragon Tattoo and Channing Tatum who I have it on good authority is hot off everything including his previous collaborations with Steven Soderbergh: Haywire and Magic Mike as well as Catherine Zeta-Jones. Below is an artists impression of what the Jude Law signed poster from Side Effects might look like. If you squint and imagine that Jude Law's signature is on the Side Effects quad poster below. In SIDE EFFECTS Jude Law plays a psychiatrist who sets of a chain events that has an impact on a New York couple already beset in a complicated situation. 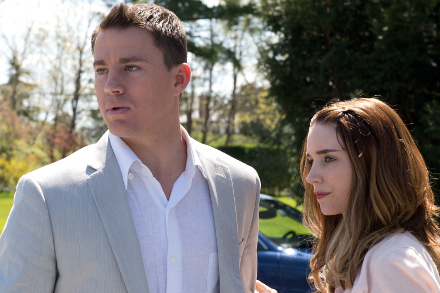 Once a successful New York couple, Emily (Rooney Mara) and her husband (Channing Tatum) are now struggling to readjust to life after his recent release from prison. Emily is plagued with a clinical depression and, following a car crash, is referred to respected psychiatrist Dr Jonathan Banks (Jude Law) who offers the latest in prescription drugs to try and alleviate her anxiety. However as Emily’s relationship with both Dr Banks and her prescribed medication intensifies, she finds herself descending into a chemical-fuelled nightmare where the lines between fantasy and reality become dangerously blurred. From visionary director Steven Soderbergh comes a riveting psychological thriller where neither the symptoms nor the cure are quite as straightforward as they seem. For the chance to win this to be honest fairly amazing prize of A JUDE LAW SIGNED SIDE EFFECTS POSTER! All you have to do is head over to The Establishing Shot’s Facebook page and hit the Like button and comment on the competition post naming either your favourite Jude Law or Steven Soderbergh film. If you have liked our page previously just drop the comment mentioned above on our page to be entered. A winner will be chosen randomly and we'll contact you for your contact details of where to send your poster. *Standard competition rules and common sense apply. UK & Greece winners names will be will be chosen randomly (by randomly I mean fed into my new Super Computer a Heuristically programmed ALgorithmic computer which will profile your names and select people that would enjoy the film, then print a list of names out which will placed on a dartboard and darts (or other objects in easy reach will be used to select the winners). THE ESTABLISHING SHOT: WIN! AN EXCLUSIVE JUDE LAW SIGNED SIDE EFFECTS POSTER! Pretty awesome. I still think he excels in Closer. Top draw stuff.